The pet fence difference you can feel for yourself! It's one thing to make a product that keeps your pet safely in the yard, it's another to thoughtfully design a fence with features that make it safer and more comfortable too. Perimeter's exclusive Comfort Contacts cushion your pet's neck with soft rubber, unlike the hard steel probes used in other pet fences. Veterinarians prefer the softness of the Comfort Contacts to help reduce the incidence of skin irritations. Perimeter's exclusive Comfort Contacts cushion your pet's neck with soft rubber, providing a lighter touch solution to hard steel contacts. Veterinarians prefer the softness of the Comfort Contacts to help avoid serious skin irritations. fence set to have a field width of 8 ft. will have a maximum variation in field width of 5% (less than 5 ) while a competitive system can have a variance of up to 100% either way for cold or warm environments. In other words, other systems potentially could have no signal field in cold environments or twice the field width in hot environments. This could mean your dog fence system may not be able to contain your dog due to limit field width or could correct your dog inside the safety of your home. 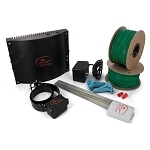 Patented Wire Check Only Perimeter® brand dog fence systems feature the ability for the state of the art transmitter to monitor wire input and output automatically. 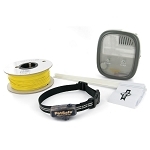 This ability allows the system to perform even with damage to the boundary wire. (No System can function with the wire completely broken.) The field width will remain constant on both sides of a damaged boundary wire due to the power output management built into every Perimeter® brand dog fence. Should you experience a catastrophic event resulting in total wire failure your system will give you a constant audible indication of the breach. 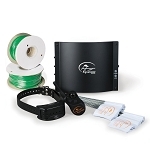 Patented Battery Check Only Perimeter® brand dog fence systems monitor the status of your battery every two hours to ensure you know when your dog fence needs a new battery. Other brands offer low battery indication however it only lets you know when the battery dips below a certain output level. The chemical composition of a battery fluctuates over a variety of different operating conditions which could potentially signal a false low battery indication. Perimeter® brand systems save you time and money by requiring 3 consecutive low battery triggers to set off the low battery indication. 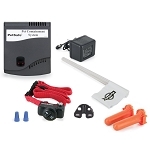 Why not keep your dog safe at home without spending extra money on unnecessary battery changes. Most Humane Contact Points: Comfort Contacts by Perimeter® offer the most comfortable solution to create contact with your dog. Conductive metal infused rubber provides significant protection against pressure necrosis, a condition which occurs when a dog either has a negative skin reaction to metal touching their skin or the collar is left on for a prolonged period of time. Soft conductive rubber contacts allow the contact to remain constant keeping your dog safe at home with utmost is comfort. Custom Correction Programming: Five programming options are available for each dog on the system. You may have a small timid dog which requires far less correction than your other large bull-headed dog. 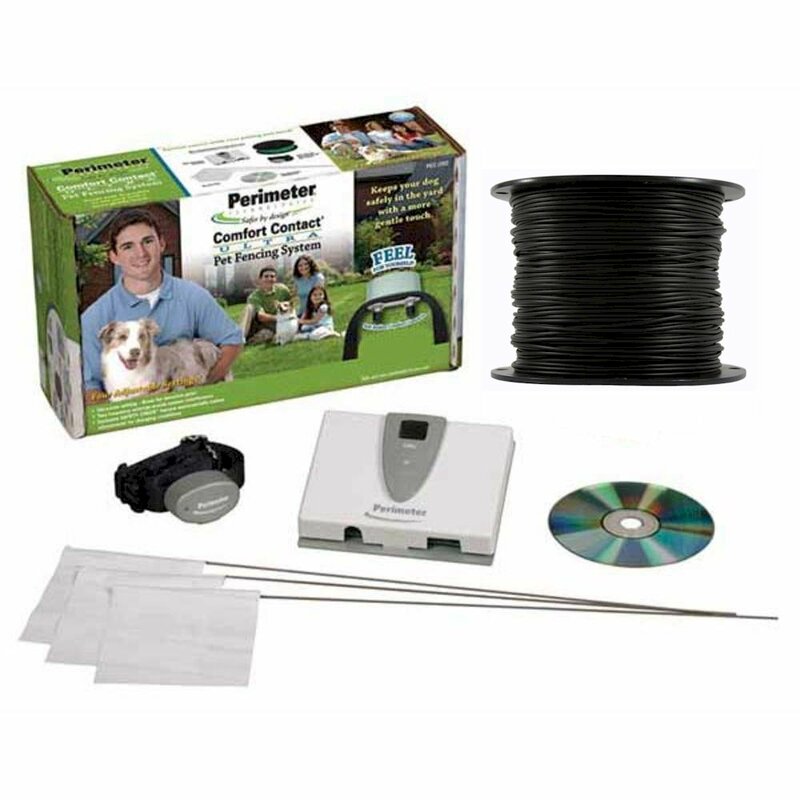 Perimeter® brand dog fence systems give you the ability to custom program each receiver to match the dog's temperament. Should your dog fence administer the same correction to your timid dog just to keep a stronger willed dog in the yard? That doesn't sound safe or humane? Perimeter® products are designed and manufactured in the& USA. Perimeter® Technologies is proud of our heritage as some of the original dog fence industry founders as well as our future as a domestic manufacturer of premium dog fence safety products. Why send your hard earned dollars overseas? Why trust the safety of your dog to anyone less than your fellow pet loving Americans?